The Honourable CM of AP Sri N Chandra Babu Naidu on Saturday offered prayers to Lord Venkateswara Swamy along with his family members. 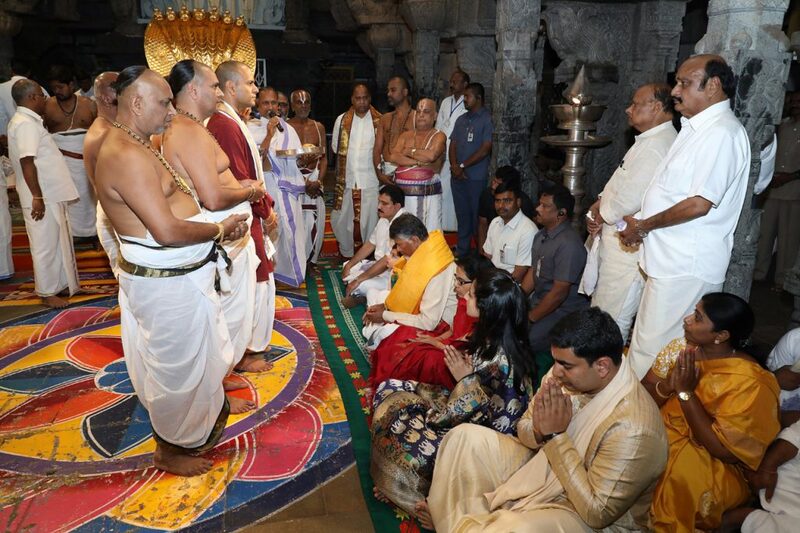 The TDP chief reached Tirumala around 12.30 pm and entered in to temple through vaikuntam queue complex along with his wife Nara Bhuvaneshwari, Son Nara Lokesh, daughter-in-law Nara Brahmani and grandson Devansh. On his arrival at Tirumala temple in front of mahadwram CM was received with temple honours isthikaphal by the TTD officials. Later the vedic pundits offered him Vedasirvachanam at Ranganayakula Mandapam. TTD EO Sri Anil Kumar Singhal, JEO Tirumala Sri KS Sreenivasa Raju offered him Theertha Prasadams and laminated photo of Lord Venkateswara.